Head coach Nick Saban and the Alabama Crimson Tide remain atop the College Football Playoff rankings. The playoff semifinals match the No. 1 seed vs. the No. 4 seed, and No. 2 will face No. 3. The semifinals will be hosted at the Cotton Bowl and Orange Bowl on Dec. 29. The championship game will be played on Jan. 7, 2019 at Santa Clara, Calif.
Oklahoma was No. 5 in the pivotal second-to-last College Football Playoff rankings released Tuesday night, ahead of Ohio State heading into championship weekend when the final four will be set. The biggest question facing the selection committee this week was how much to value Ohio State’s 62-39 blowout of Michigan on Saturday. The answer: The Buckeyes moved up four spots but were still stuck behind the Sooners. The top three teams in the selection committee’s rankings, released Tuesday, held steady for a fourth straight week. Alabama, Clemson and Notre Dame — all unbeaten — are Nos. 1, 2 and 3. Georgia moved into the fourth spot that was previously occupied by Michigan, heading into its SEC championship game against Alabama. It’s a given the SEC winner makes the playoff. Maybe the loser, too. Notre Dame is already in the clubhouse at 12-0 and Clemson faces Pittsburgh in the Atlantic Coast Conference championship game. That leaves one spot very much in play. Ohio State faces Northwestern (8-4) in the Big Ten championship in Indianapolis and Oklahoma rematches Texas (9-3) in the Big 12 title game in Arlington, Texas. The Longhorns handed the Sooners their only regular-season loss in October. Ohio State’s lone loss was by 29 points at Purdue. Can the Buckeyes vault past the Sooners if both win Saturday? There is some precedent. In 2014, Ohio State beat Wisconsin 59-0 in the Big 12 championship game and jumped from sixth to fourth, passing co-Big 12 champions Baylor and TCU. The Buckeyes might need a similar performance to have a shot this time. What else could make for mystery heading into selection Sunday? The defense-smitten committee could be presented with an alternative option for the fourth spot depending on how things go in the SEC championship game. It will drive fans outside of SEC country out of their minds, but Alabama seems like a lock to make the playoff even if it loses — barring some kind of epic beatdown of the Tide by the Bulldogs in Atlanta. Note: Alabama has never lost a game by more than 14 points under Nick Saban. What will make SEC haters even angrier: What if Alabama beats Georgia 31-28 on a last-play field goal and the committee is so impressed with the Bulldogs they just throw them in there at No. 4, despite the two losses and lack of a conference championship? That seems extreme considering the committee has yet to include a two-loss team in the playoff, bypassing ones with conference championships for one-loss teams without. But if Ohio State and/or Oklahoma are unimpressive winners on Saturday — or they both lose — the CFP could have two SEC teams in it for the second straight season. And, just to make even more people angry, Notre Dame’s inclusion would mean three of the Power Five conference would not be represented. Looks good for the Tigers. Don’t bet on Clemson losing to Pitt (7-5) in the Atlantic Coast Conference championship game this weekend — seriously, do not do that. If it were to happen, though, would it really be worse than losing to Purdue the way Ohio State did? And could the committee really pass over Clemson’s balance on both sides of the ball — fourth in offensive yards per play and third in defensive yards per play — for the lopsided Sooners? Not having that conference championship could get tricky, and Ohio State and Oklahoma fans would cry strength of schedule because of a down year in the ACC, but having played Texas A&M and South Carolina outside the conference means the numbers look OK there for the Tigers, too. 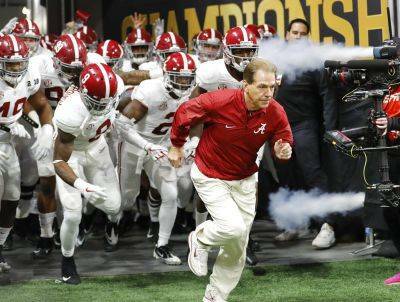 https://www.limaohio.com/wp-content/uploads/sites/54/2018/11/web1_saban-1.jpgHead coach Nick Saban and the Alabama Crimson Tide remain atop the College Football Playoff rankings.